If you have young girls that have been swept up into the bestselling book series by Jim Benton, "Dear Dumb Diary" - they won't want to miss the upcoming television movie event of the season! Directed by Kristin Hanggi, director of the multiple Tony Award-nominated hit Broadway musical Rock of Ages, co-written by Benton and Hanggi and executive produced by Janet Zucker (Friends with Benefits, First Knight) and Jerry Zucker (Airplane!, Naked Gun, Ghost), Dear Dumb Diary is “must see TV” for kids of all ages. Follow Jamie Kelly (Emily Alyn Lind; Secret Life of Bees, J Edgar) as she navigates Mackerel Middle School with the help of her best friend Isabella, her nemesis Angeline, and the boy of her dreams, Hudson Rivers. They encounter all the awkward, humorous and, in our case, musical moments the middle school experience (ordeal?) provides. Jim Benton’s bestselling Dear Dumb Diary book series has sold more than eight million copies and has been translated into 18 languages. His It’s Happy Bunny licensing hit has generated over three quarters of a billion dollars at retail. 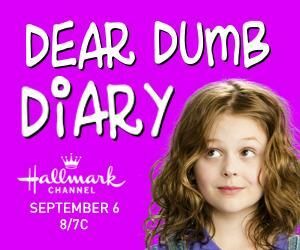 Dear Dumb Diary airs on the Hallmark Channel, September 6, 2013 at 8/7C . Check your local listings.